Would you like more control over access to your forms? 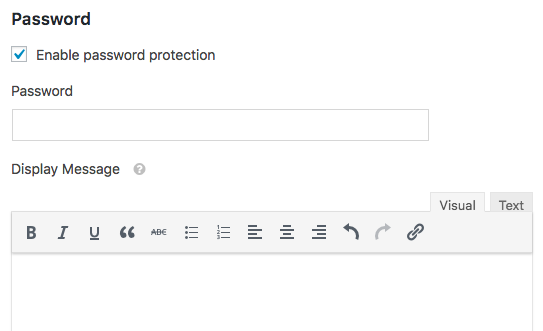 With the Form Locker addon, you can password protect your forms, limit submissions, and so much more. In this tutorial, we’ll provide a step by step guide on installing and using the Form Locker addon in WPForms. Requirements: You will need a Pro license level or higher to access the Form Locker addon. As the first step, you’ll need to be sure you have installed and activated WPForms. Once that’s all set, you can go ahead and install the Form Locker addon. All settings for the Form Locker addon are within the form builder. To view these settings, you’ll need to create a new form or edit and existing form. For our examples, we’ll create a form where users enter a contest. 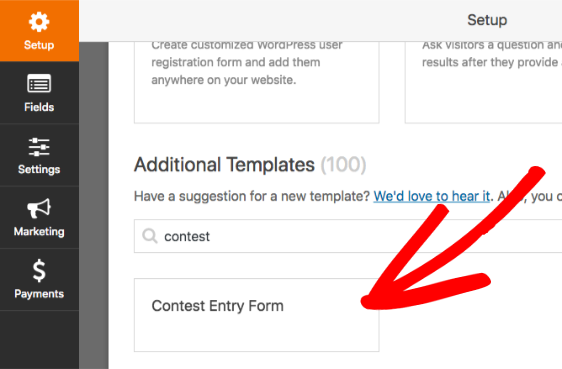 Using the Form Templates Pack addon, we’ll select the Contest Entry Form template. 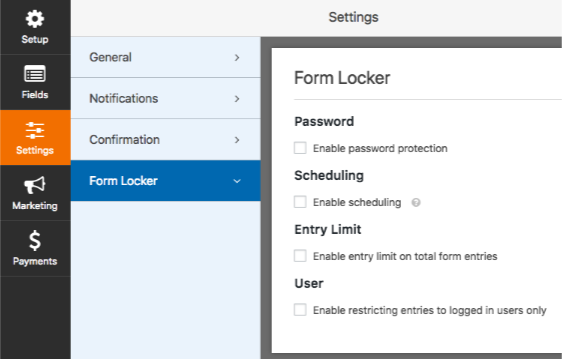 After opening the form builder, you’ll need to go to Settings » Form Locker to check out the Form Locker options. We’ll discuss each option in more detail below. The Password option will require all users to enter a specific password before your form can be seen. You can set any password you’d like, and set a message that will display with the Password field. To enable, check the box labeled Enable password protection. Password: The password that users will be required to enter in order to access the form. Message: The message that will display above the Password field. 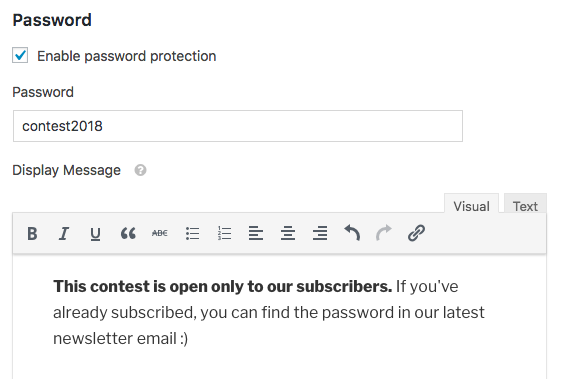 For our contest form, we only shared the form password with our newsletter subscribers. We’ve explained this in the Message setting as incentive for others to subscribe to our newsletter for access to future contests. 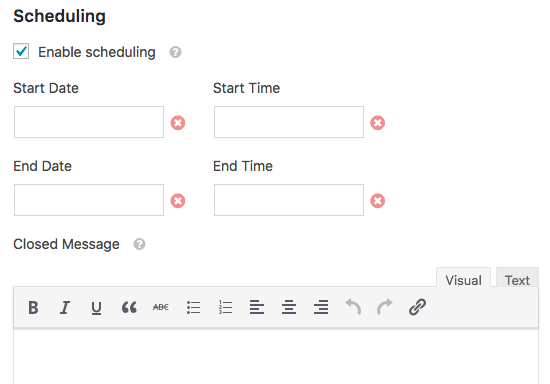 The Scheduling option allows to set the date and time that a form will be accessible. If a user tries to view a form before or after those dates/times, they’ll see the Closed Message. To enable, check the box labeled Enable scheduling. You can also leave either the Start or End fields blank, and so only set a time for opening or closing. 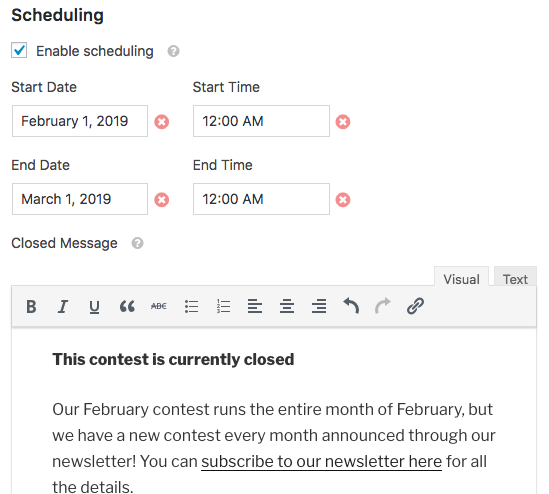 Our contest form is only open for the month of February, so we’ll set the form to open at midnight on February 1st and to close at midnight on March 1st. Outside of those times, we’ll share a brief explanation to users. 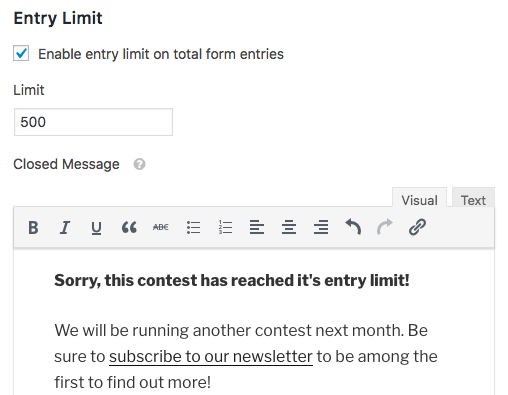 If you want to place a cap on the number of entries allowed for a form, the Entry Limit option is a good fit. This will limit the total number of entries allowed for a form. 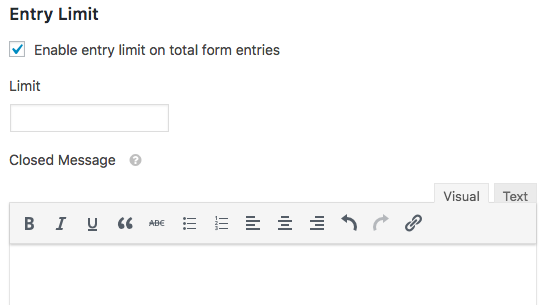 To enable, check the box labeled Enable entry limit on total form entries. Limit: The maximum number of entries allowed for the form (total). Closed Message: The message that will display after the entry limit is reached. Note: If you’d also like to prevent the same user from submitting more than one entry, please see the Prevent Multiple Entries section. For our contest form, we only want to accept up to 500 entries. After that, the form will automatically close. When this happens, our message will invite users to sign up to our newsletter to find out how to enter next month’s contest. In some cases you may want to only allow logged in users to view your form. The User option will allow you to easily add this restriction. To enable, check the box labeled Enable restricting entries to logged in users only. Once this box is checked, a Message field will display. This is the message that will display to logged out users who can’t access the form. For our contest example, we want to use the contest as incentive for registering to our site. So in order for a user to enter our contest, they must first register and log into our site. Note: You can easily let users register and log into your site with the User Registration addon for WPForms. Please check out our User Registration addon tutorial for all the details. If a user isn’t currently logged in, we’ll share a message with links to our registration and login forms. 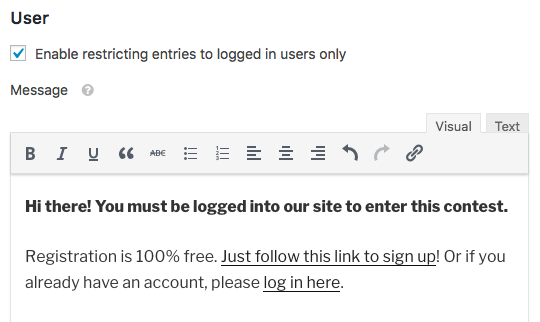 If you’d like to prevent the same user from submitting multiple entries, you can require unique values for certain fields. That way, the same name, email, etc will not allowed to be submitted with more than one entry. 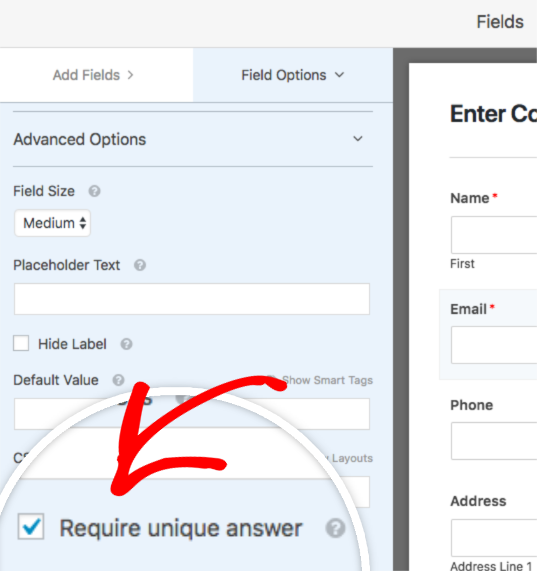 To enable this, you’ll need to add the field to your form and then click on it within the preview area. This will open its Field Options panel. From here, open Advanced Options and then check the box labeled Require unique answer. For our example, we only want users to be able to enter the contest once. To help with this, we’ll require unique values for the Email and Phone fields in our form. That way, the user would have to provide us with a new email address and phone number every time they submit an entry. That’s it! You can now use the Form Locker addon to restrict access to your forms. Next, would you like to collect statistics and generate reports on the data collected in your forms? Be sure to check out our Surveys and Polls addon to take your form’s functionality to the next level. Fixed: Typos, grammar, and other i18n related issues. Added: Complete translations for Spanish, Italian, Japanese, and German. Fixed: PHP fatal error if using PHP 5.4. Fixed: Conflict with multiple password protected forms on the same page.